Under the able direction of Nepali theatre pioneer Sunil Pokharel, William Shakespeare’s epic fantasy A Midsummer Night’s Dream gets a Nepali rendition, A Midsummer Night’s Sapana, filled with spectacular performances, effectual lighting and a brilliant live score. Currently being staged at Gothale Natakghar at Shilpee Theatre, this interpretation is a milestone for Nepali theatre, which is oftentimes plagued by pitfalls when adapting western plays. 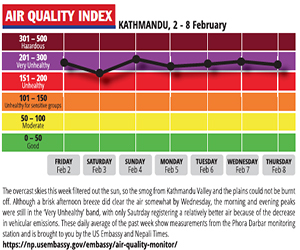 But coming from the man who kicked off the theatre scene in Kathmandu, you wouldn’t expect any less. The play begins with Maharaj Trichandra Jung (Safar Pokharel) planning his wedding with his queen, when commoner Akkalman (Suraj Chaulagain) comes to the palace with a problem. He wants to marry off his daughter Hira, who is desperately in love with Lalit (Sangeet Sapkota), to another man, Kiran (Avash Adhikary). When the king commands she follow her father’s will or face punishment, the lovebirds flee with Kiran and Hemlata (Hira’s friend who is in love with Kiran) right on their heels. The four of them wind up in the same forest as fairy king Indradev and fairy queen Tejashwi, who are in the midst of a lover’s quarrel, and a group of commoners practicing a play to perform at the royal wedding. With the introduction of Chature (J.D. Tamu), the fairy king’s loyal imp, the story progresses and takes a supernatural turn with tricks, mischief, and magic. To those already familiar with the original play, the story may be predictable, but this production successfully creates an engaging tone to suit the taste of a Nepali audience. The dialogue translated into Nepali departs from the poetic prose of the original and is often laced with popular jargon and double entendre, with costuming also reflecting the diversity within the Nepali culture. A single, multi-level set designed by Anup Baral is used for the entire play, and the actors utilise the stage beautifully, popping in and out from under the ramp. The lighting and background score by musical trio Baaja.music deserve special mention for setting the tone and mood for each scene without being distracting. The director playfully weaves the band into the play, making them as much a part of the drama as the actors themselves. With music comes dancing. 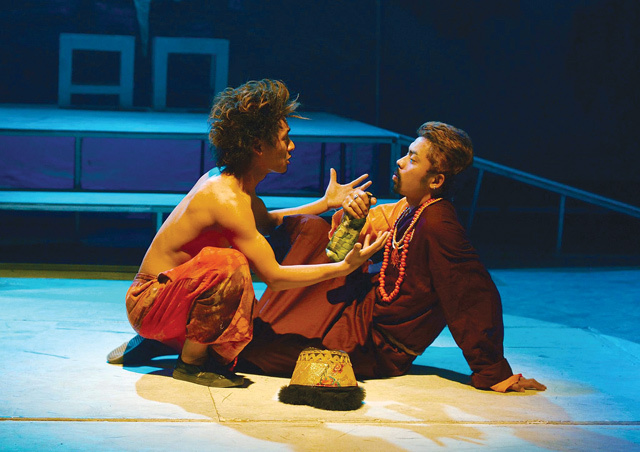 Staying true to Shakespeare’s original production, much of the dancing is focused on the fairies, and choreographer Pradeep Lama does a commendable job in introducing the different personas of the characters between scenes. The amateur cast that includes students from Pokharel’s recent theatre training program is up to the task, led by Tamu’s Chature, who swishes in and out of the set with his acrobatic moves and mischievous smile. Bijay Tamrakar does well as the mischief making but well-meaning king of the fairies, Indra Dev, and Sapkota’s Lalit is entertainingly filled with exaggerated facial expressions and dialogue delivery. But the star of the play was Anil Subba, who shines through and through as Baley, the cloth merchant who wants to play all the characters by himself in the reenactment of Kamdev and Rati – a tragic comedy his group is preparing for the royal wedding. He is boisterous, self-indulgent, and all-around hilarious. It takes tremendous skill to make the audience laugh out loud simply with body movements and Subba does so effortlessly with his expressions hidden behind a pig’s head. The play within the play has the audience roaring with laughter and adeptly ties everything together at the end. Cast: Safar Pokharel, Suraj Chaulagain, Nisha Joshi, Avash Adhikary, Sangeet Sapkota, JD Tamu, Pujan Thapa, Bijay Tamrakar and others.